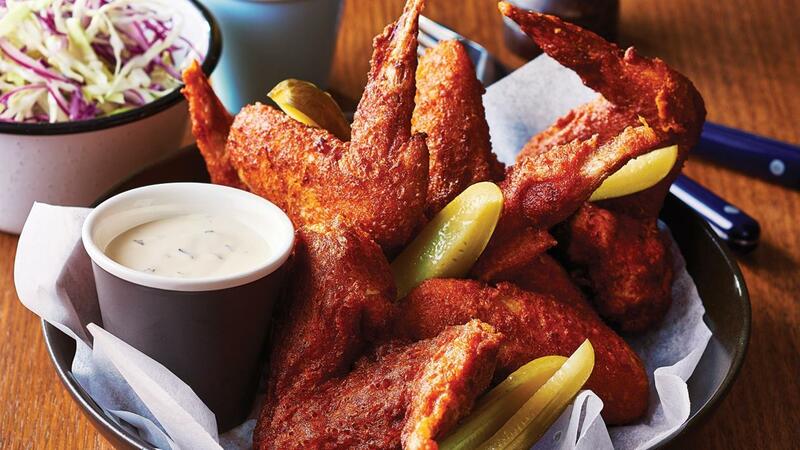 Nashville's most iconic food, crispy fried chicken at its best. The key to its success is in the 24-hour marinating with buttermilk and smoky chilli. In a bowl, combine the chicken, buttermilk, KNORR Mixed Chilli Puree, 10 g salt and sugar, then marinade in the fridge overnight. Mix flour, smoked paprika and 15 g salt together, then divide into two. Strain the buttermilk marinate off the chicken and mix with one of the divided flour mixes to form a light batter. Dip in the marinated chicken into the other divided flour mix then into the batter mix. Shake off excess batter and fry in hot oil (160 degree Celsius) for 10 minutes. Transfer to a plate, lined with a paper towel. In a bowl, combine the HELLMAN'S Ranch Dressing with the blue cheese and blend until smooth.